By the same token, I suppose many Dapsters too would be struggling to pronounce “Selamat Hari Raya” without any of their predictable pelat that makes one cringe. That’s the reality of Malaysia. 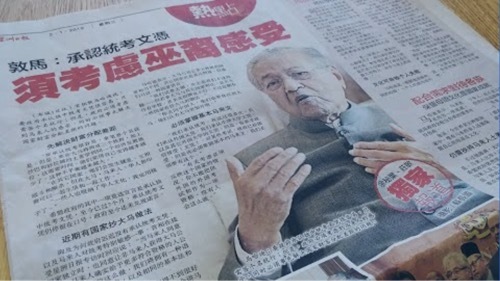 Cina-DAP fans of “beloved Tun” have somehow convinced themselves that their repentant-and-reformed premier is now preaching an inclusive message of diversity. Well, that’s the (illusionary) multiculturalism they ‘hear’ despite the audio-visual evidence above of how clumsily Tun mangled his attempts at extending ‘gong xi’. Yup, that’s what the PM himself said in his very own words – nope, not quoting something long ago from the 1970s – but from a recent interview only last month when he was commenting on Harapan’s non-recognition of UEC. Mahathir has not changed at all. The following is a verbatim transcript from Mahathir’s chat with Sin Chew. “Well, the Malays when they agreed to independence, they agreed that non-Malays must also be given citizenship, and indeed they gave more citizenship than people who are qualified, but they believed that by so doing, we will have a country with one language, one culture and basic laws and understanding that are all very Malaysian. “But they found that even the language (inaudible) and all that was not very well supported, and many people until now cannot speak Malay at all, and yet we accept them. I think how much more do you want to ask them to accept? “This country is quite different from other countries. Other countries have got multiracial people, but they speak one single national language”. Entry filed under: #NotMyPM. Tags: deranged Dapsters. Aunty can you sync your spinning properly? Your lookalike Papagomo keeps bitching that DAP controls Tun. You keep saying otherwise. People not stupid you know. Surely you want your allowance right?